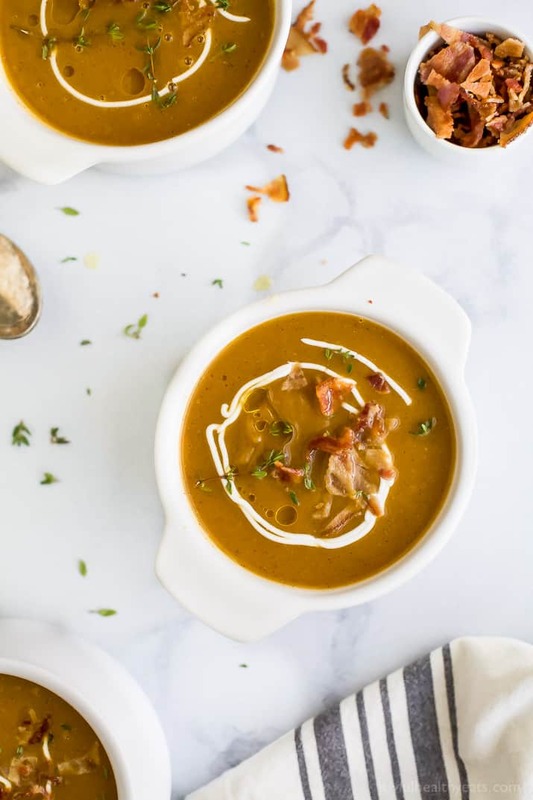 Instant Pot Autumn Squash Soup a creamy soup filled with fall squash and tummy warming spices. 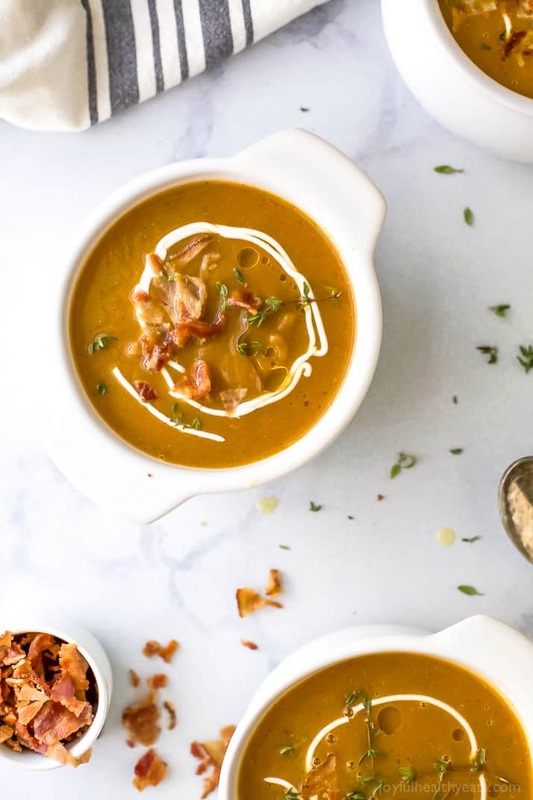 Paleo Instant Pot Autumn Squash Soup, filled with butternut squash, acorn squash, tummy warming spices and topped with bacon. 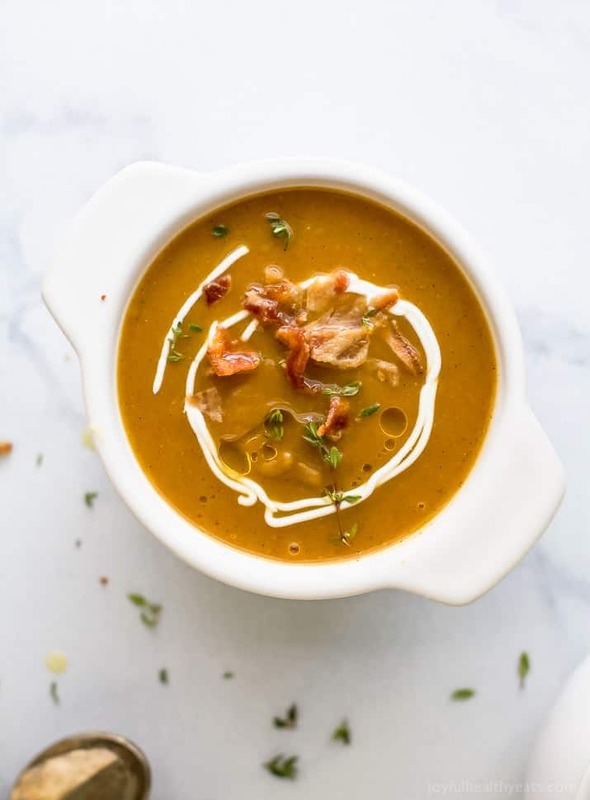 An easy creamy squash soup that’s guaranteed to be the star of the fall! Tomorrow I will be married for 12 years! Can you believe that! I can’t. It seems like so much longer and so much shorter all at the same time. Is that possible? Guys, in this day and age we’re considered an old married couple! And you know what. I’m perfectly okay with that! My parents have been married for 39 years and Mike’s parents have been married for 40 years! I hope and pray that that it is us one day. When we got married one of the things we both said is that divorce is not an option. Yes, love is a feeling but it’s also a choice. I chose to marry Mike and be with him the rest of my life. I want my kids to be able to have a legacy of love and commitment in their lives. For them to see that some days are like eating ice cream and pure bliss, while others are like choking down that nasty vegetable. So today, tomorrow and every day after that I choose Mike. (even when sometimes those “feelings”aren’t there and I’m wanting to breathe dragon fire on him… because let’s be honest ladies when that time of the month comes around we definitely want to do that) Can I get an amen! When Mike and I first started dating it was long distance. Actually the entire time we dated it was long distance. We added up the amount of time we were together … in the same state … before we got married and it was 1 month! Because we dated long distance the entire time when we finally were able to see each other all I wanted to do was snuggle with him and watch a movie. I didn’t want to do anything else but be in his arms. Todays Autumn Squash Soup reminds me of those times! Ultimate Comfort! It’s a recipe I want to put in a big soup crock, wrap my hands around it, cover up with a cozy blanket, snuggle up with my husband and watch a movie. 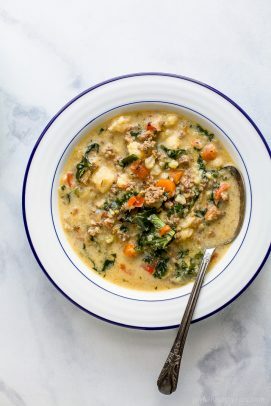 Everything about this soup screams comfort to me. 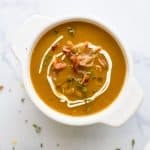 This Instant Pot Autumn Squash Soup has two kinds of squash in it. Butternut Squash and Acorn Squash. (acorn squash is one of my favorites in the fall) Then it is filled with tummy warming spices like cinnamon, nutmeg and clove. For a slight smoky taste I added in smoked paprika. If I’m being honest, this soup kinda gave me a run for my money. I think I went through like 10 spoons testing it because I couldn’t figure out how to cut through the tangy flavor I was tasting. Then on a whim I added chili pepper olive oil and that did the trick! 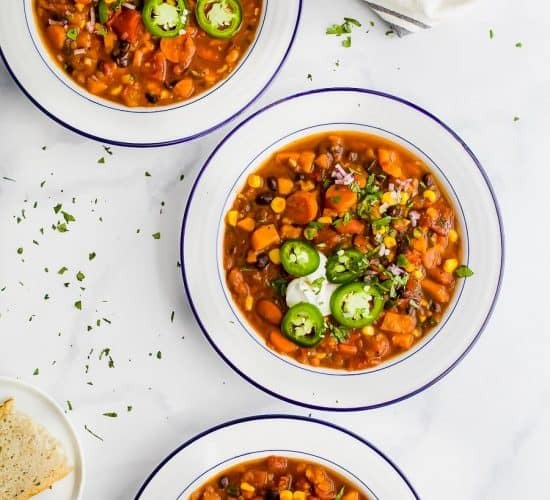 The fat from the olive oil and spice from the chili pepper helped balance out the soup and turned it to pure fall perfection. A drizzle of greek yogurt to make it creamy. Crunchy grilled cheese for dunking… cuz.. duh! Can’t wait to hear what y’all think of this one! Bon Appetit friends! 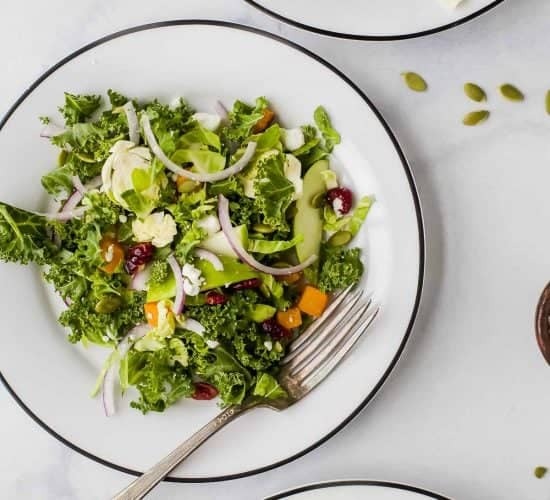 Add Grape Seed Oil to the Instant Pot. Next, add diced onions to the Instant Pot. Saute until translucent and slightly browned, about 4-5 minutes. Then add in butternut squash, acorn squash, vegetable stock, cinnamon, nutmeg, clove, garlic powder, smoked paprika, and fresh thyme. Stir to mix everything together. Place the cover on the Instant Pot. Seal the lid. Cancel the Saute setting. 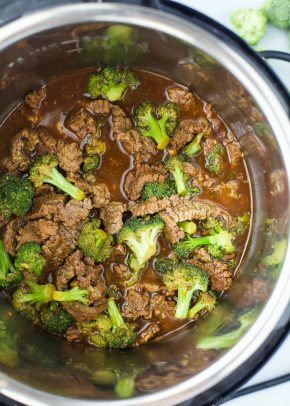 Switch the Instant Pot over to the Soup/Broth setting and set timer for 15 minutes. Add all of the soup to a blender, along with lemon juice, honey, salt to taste and chili olive oil. Blend until the soup is a “soup” completely smooth and liquidy. 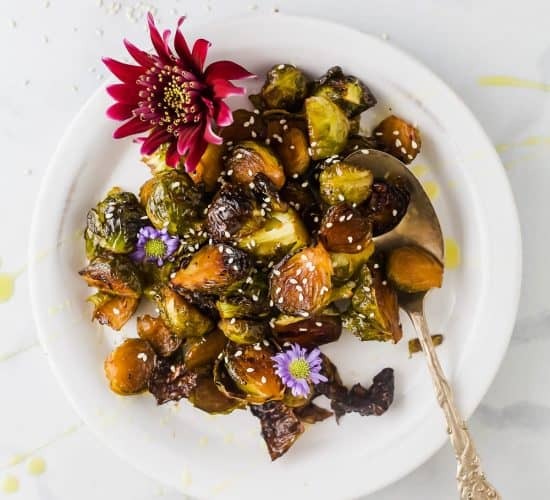 The fall spices in this are a BRILLIANT idea! Ive just added the rest of the ingredients to my grocery list to make! It is my kind of comfort food! 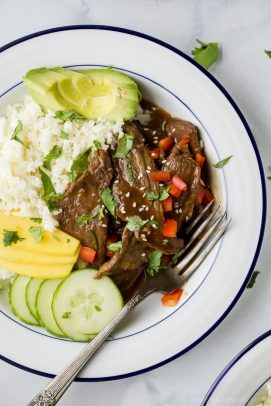 I love that this can be made in the Instant Pot! 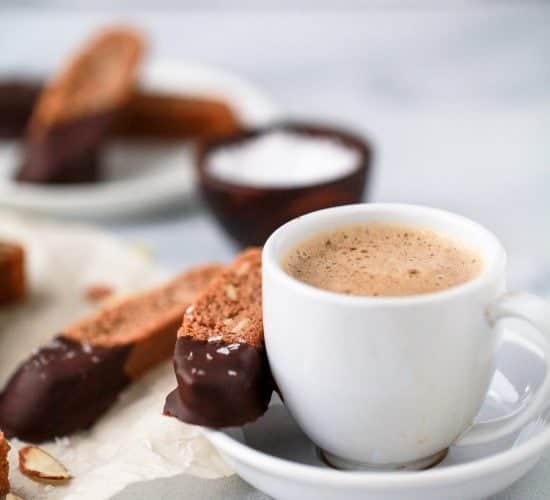 So easy and sounds so delicious! Yummy, I need an extra sprinkle of bacon in mine! 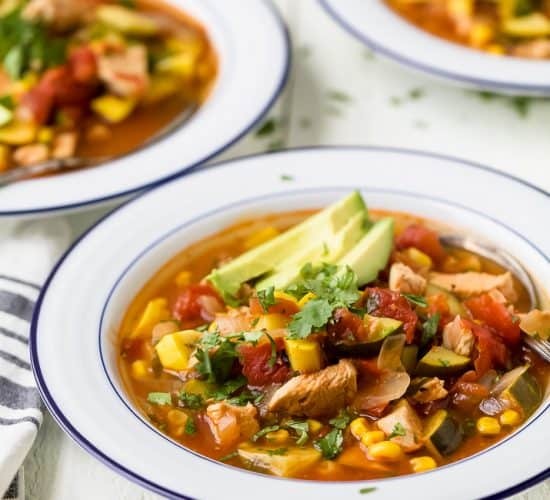 I seriously love everything about this soup! 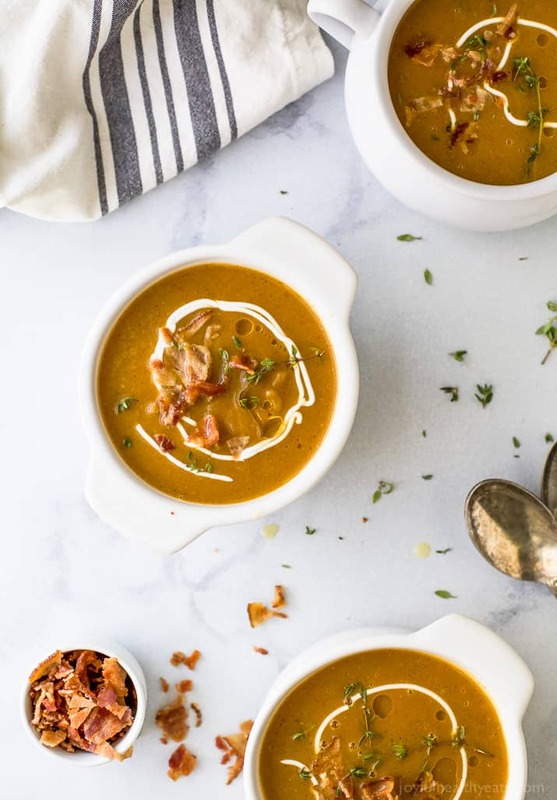 This Paleo Instant Pot Autumn Squash Soup is one of the most loved in my family! We especially love it during the cold winter months. Pinned for later! My husband and I have been married 26 years, so I’m with you on the commitment part. Sure we have our moments, but who doesn’t? Anyway….I love your pictures and the chili pepper oil is brilliant! 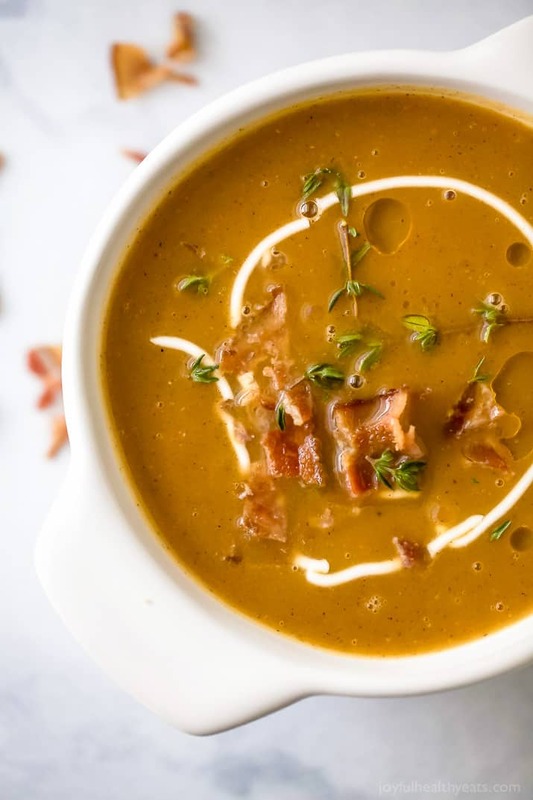 I make squash soup all the time in the fall…I’m going to have to try this!